Domestic equity flows have once again turned negative over the course of the last two weeks. Fixed inflows have been positive for thirteen consecutive weeks. From a return standpoint, equities have far outpaced fixed-income or bond returns. A little less than a month ago, I wrote a post noting weekly flows into equity mutual funds and ETFs had turned decidedly positive, and in fact, were the largest inflows looking back an entire year. I rhetorically pondered if the increase in equity flows was a sign equity markets were topping, especially after such a strong start to the year. From a contrarian perspective, had investors jumped into equities near a market top, even if just an intermediate one? On the contrary, as the below chart panel shows, domestic equity flows have once again turned negative over the course of the last two weeks. 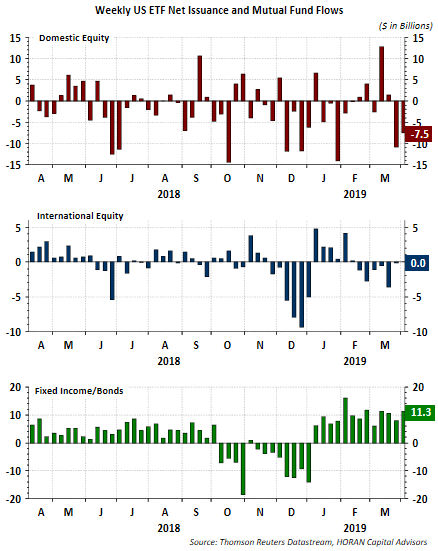 If world equity flows are included, equity flows are negative for the last three weeks, according to ICI data. Fixed inflows have been positive for thirteen consecutive weeks. 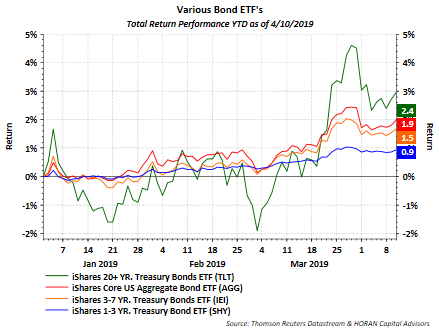 From a return standpoint, equities have far outpaced fixed-income or bond returns as seen in the following two charts. 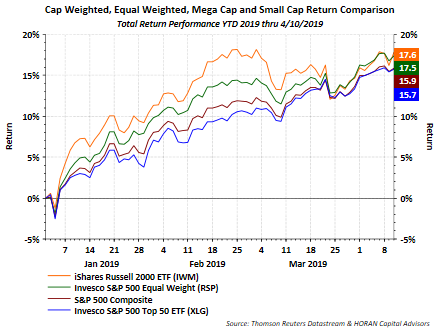 Notable in the equity return chart is the top-performing equity index is small-cap, followed by the Equal Weighted S&P 500 Index. In other words, the equity market returns are more broad-based, and this is a positive market sign. The weakest returning index is the one consisting of the 50 largest S&P 500 market capitalization-weighted stocks. Fixed returns are low single digits, and this is the area of the market attracting investor dollars. As it relates to sentiment and from a contrarian perspective, market peaks, even if only short-term, tend to occur when individual investor bullish sentiment is at an extreme. 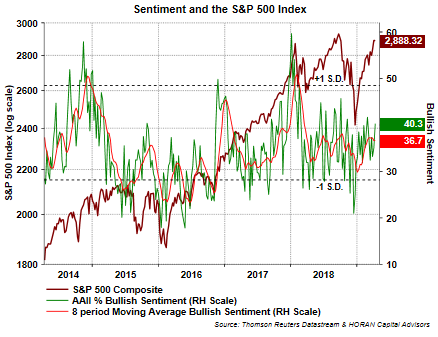 This week's AAII Sentiment Survey reports bullish sentiment at 40.3%, which is just slightly higher than the average bullishness reading of 38.2%. Certainly not at an extreme level. Peter Lynch stated in an interview in 1995, "Far more money has been lost by investors in preparing for corrections, or anticipating corrections, than has been lost in the corrections themselves." In analyzing flow and sentiment data, could it be investors are preparing for a correction? If so, and given the strength of the market recovery this year, a "fear of missing out" feeling may percolate through the market and result in only minor pullbacks. My view is the market will experience a pullback that is larger than mid-single digit, but it just might occur from a higher level.